The latest in cookies. It’s here. Brought to you by the latest veganization of Eat the Love. 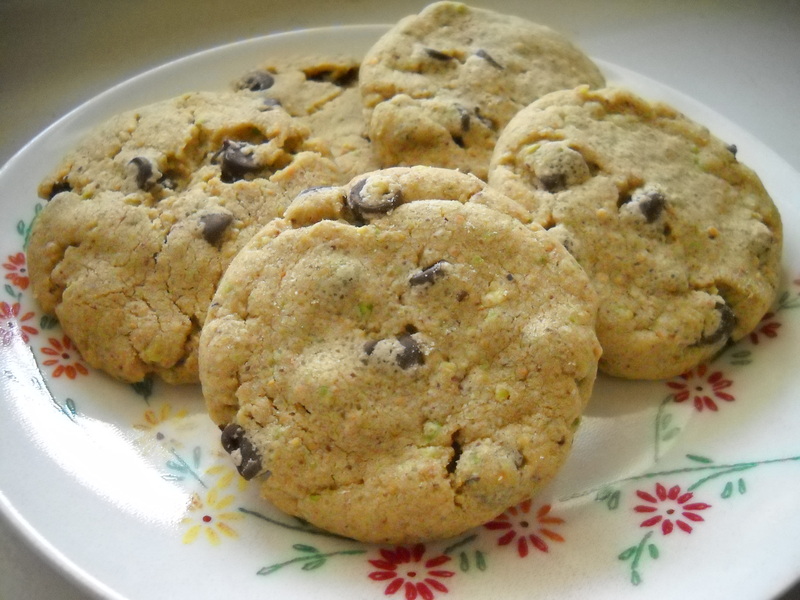 Ground pistachios, melted white chocolate and a bit of olive oil are the main ingredients that make up the batter. The dark chocolate chunks make it next level cookie. Veganized from Eat the Love. Preheat oven to 350˚F. Line a baking sheet with a silpat. Melt the white chocolate. Every cook will tell you to use a double boiler, or create your own (which is super easy). Alternatively, you can melt chocolate (white and dark) in the microwave. Just keep a very close eye, as chocolate scorches rather easily. Start with 15 or 30 seconds. If you go the microwave route, it’s best to take your chips out when your bowl is hot. The chips will probably not look melted, but just stir them around in your hot bowl for a minute and they will melt. Once the white chocolate has melted, add the olive oil or pistachio oil and stir until incorporated. Put your pistachios in a food processor. If you have a little one, use that. If you have a big food processor, use the small bowl attachment if you’ve got it (comes with most large Kitchenaid food processors). If you don’t have something small, use your blender. Blend your pistachios into a fine meal. Then add the white chocolate and oil mixture. Mix to create a paste, a delicious, delicious paste. Place the Earthy B and both sugars in the bowl of a standing mixer fitted with a paddle attachment. Cream the butter and sugar together on medium speed until fluffy. Add the pistachio paste and beat together until incorporated. Add Ener-G and vanilla and mix until incorporated. Add the salt, baking soda, and baking powder to the batter and beat until incorporated. Scrape down the sides of the bowl with a rubber spatula and add the flour. Mix until incorporated. Add the dark chocolate and stir on low speed until the chocolate is evenly distributed, just a few seconds.